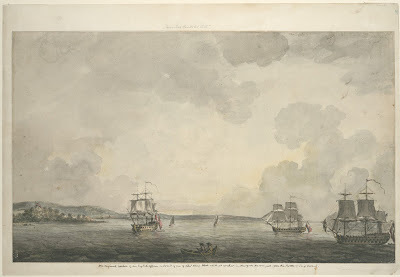 An original sketch by an English officer on board of one of Adml. 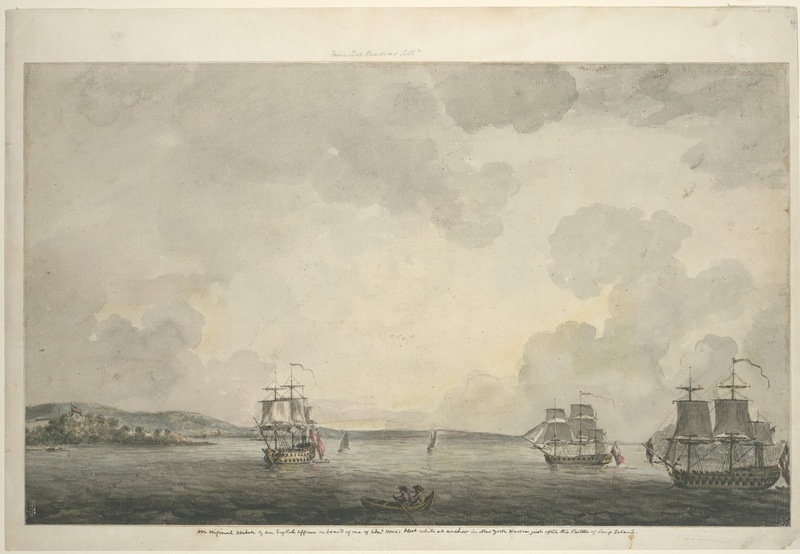 Howe's Fleet while at anchor in New York Harbor, just after the Battle of Long Island, Thomas Davies, 1776, New York Public Library. Special thanks to Todd Braisted for pointing this out to me. For anybody interested in the loyalist experience during the American Revolutionary War, he's the guy to go to. His website is great, take a look! Combined operations between the Royal Navy and the British army were crucial in the American Revolutionary War. New York was arguably the most successful of these. Tens of thousands of Hessian and British troops were carried ashore in flat bottomed boats manned by British sailors. The brothers Howe (General and Admiral) broke the back of the Continentals, who fled Long Island in disorder. This image shows a few warships lying at anchor with backed sails in New York Harbor just after the battle. At the time, it would be easy to think that the war would be short lived, and perhaps that accounts for the simple, pacific feel of Davies' piece. Thomas Davies was an officer of the Royal Artillery, and so had an eye for geography. This was enhanced by his inclination to natural science and reflected in his artistic skill. Davies depicts two men rowing their boat in the foreground. The boat has an oddly high prow, but I am no expert in the historical construction or appearance of small boats. Each oarsman wears a round hat and jacket.